We also have nearly 30 Cranes of our own of various capacity which includes both Lattice boom cranes and telescopic cranes working at different site in West Bengal, Jharkhand and Orrissa. We can also arrange cranes from our group companies as they too have cranes from 20MT to 100MT. 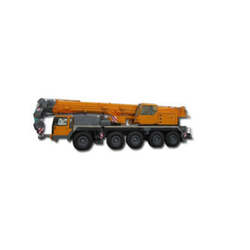 Crane Type: we have 100ton and 150ton cranes. Our esteem clients can avail from us a wide range of Telescopic Hydraulic Crane that is suitable to carry much operation as per the customer application requirement. These cranes are available in various dimensions, capacities and sizes. Mounted with high rigid tyres brings this crane to easy movement and solid grip to earth.